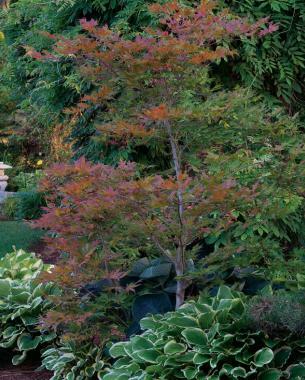 With their small stature, tremendous variety, and four-season beauty, Japanese maples always offer something to see. Dark, undulating branches sometimes crested with snow create a variety of graceful silhouettes in winter. The rest of the year, the branches provide a structure on which a slipcover of leaves spreads colors and textures. Lush, new spring growth emerges, filling the bleak landscape with a variety of hues we usually expect in fall. 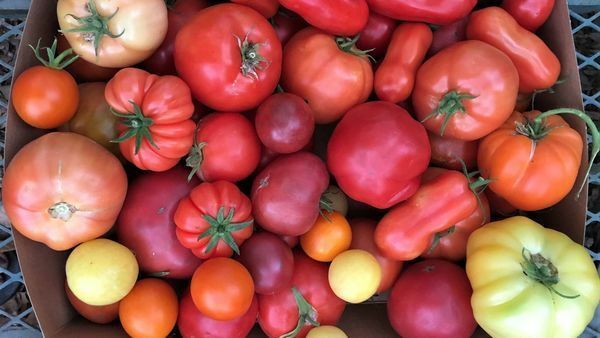 Summer brings maturity—new growth hardens off, pinks and yellows fade while greens and reds deepen. 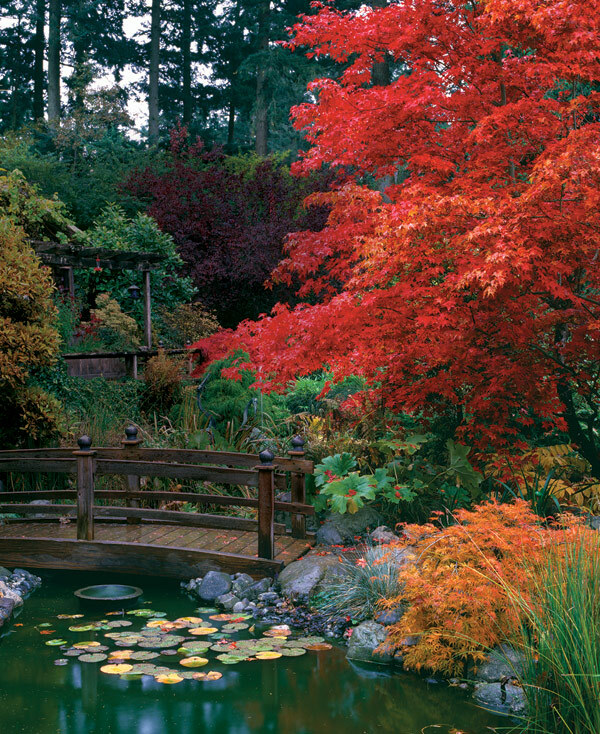 In autumn, these trees fill the garden with a symphony of colors. 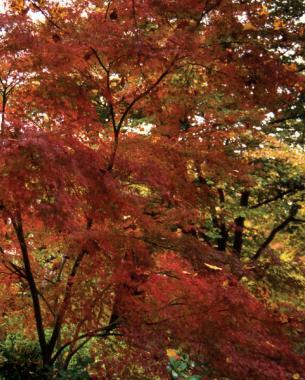 Japanese maples offer countless variations in size, shape, and texture. 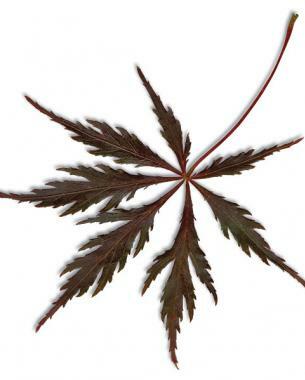 While nobody knows exactly how many different Japanese maple varieties exist, there are more than 700 unique cultivars in circulation. 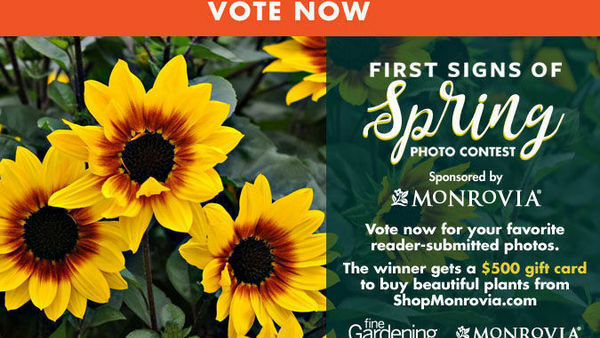 Selecting the right one from so many can be overwhelming, especially because virtually all of them are charmers. Though it was difficult to single them out, we have selected some of our favorite cultivars that are neither too obscure nor too obvious while showing a hint of the range one can find in this group of trees. 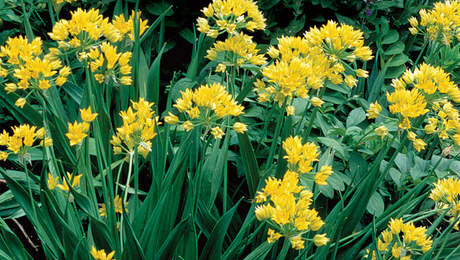 ‘Waterfall’ is a cultivar that sports green leaves all spring and summer before bursting into passionate shades of yellow and orange in fall. The crown of this 6- to 8-foot-tall tree is wide and low, resulting in a broad, slightly domed habit. It gets its name from the layers of branches that cascade softly toward the ground. 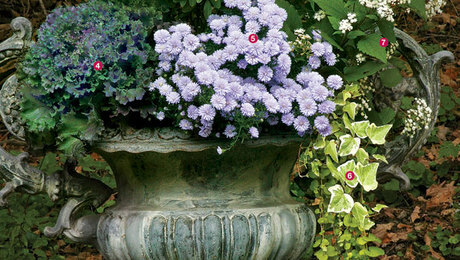 Appropriately enough, ‘Waterfall’ is an excellent choice for growing next to a water feature. 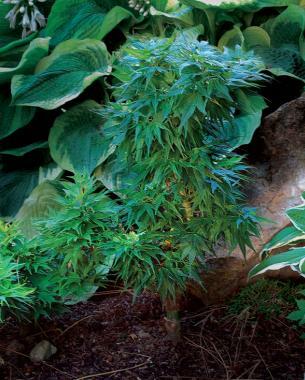 Reaching only 3 or 4 feet tall, the dwarf cultivar ‘Mikawa yatsubusa’ has the charm and warmth of a sturdy, diminutive hero from a fantastic tale. 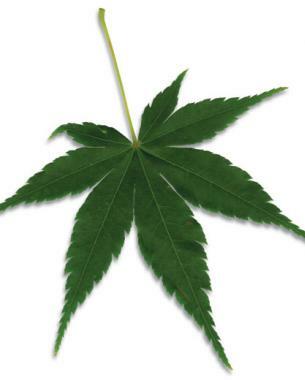 Its leaves are large for a dwarf, growing to about 2 to 212 inches long and wide. 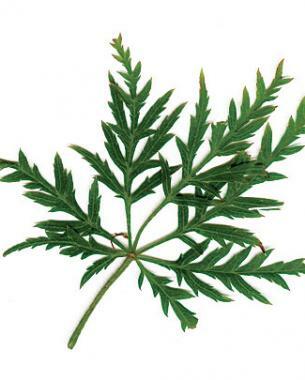 This foliage is layered tightly one over the other so that the top leaf reveals only the outer edge of the one below. 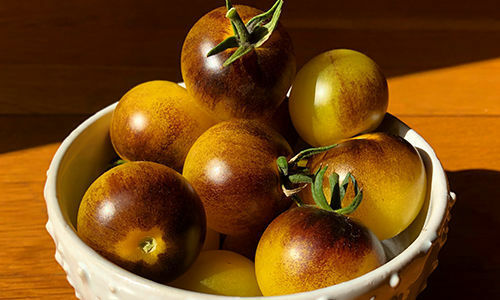 Spending most of the year covered in light green, ‘Mikawa yatsubusa’ changes to gold, orange, and purple in autumn. 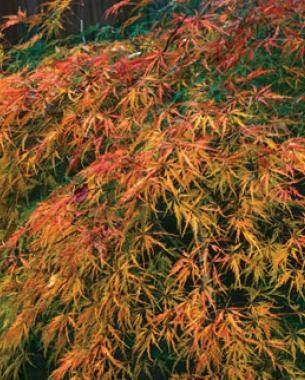 ‘Inaba shidare’ doesn’t wait for autumn to color its foliage. Drapes of delicate, deep red leaves flow across an architectural structure and down to the ground. Late summer brings out some green, but in fall that color is cast off in favor of a brilliant red. 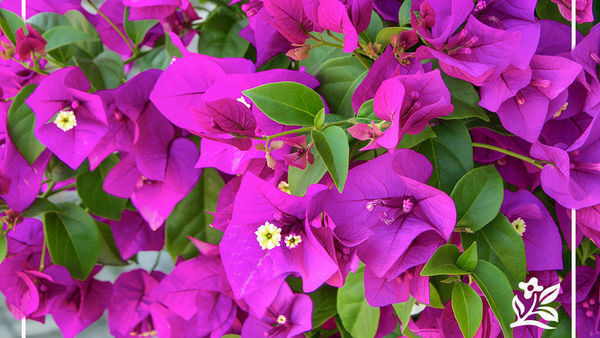 ‘Inaba shidare’ usually reaches 6 to 8 feet in height and spreads to a greater width. The growth habit is orderly and doesn’t necessitate frequent pruning. ’Aka shigitatsu sawa’ is another tree with constantly changing color. 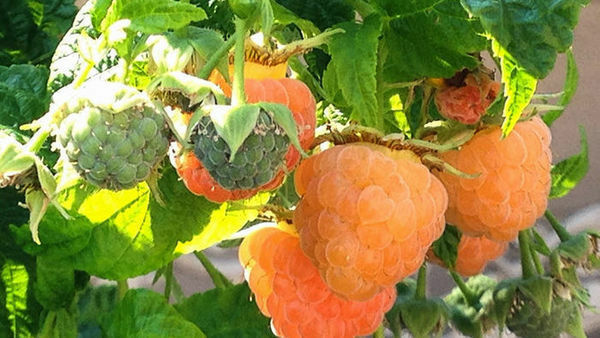 In spring, this variegated cultivar has all the vibrant colors and texture of a strawberry-kiwi smoothie. These colors change steadily and dramatically during the summer: One week, there may be a lot of green; the next week features a wash of silver; the following week, yellow slips in. The foliage ultimately turns bright red in autumn. It grows slowly to about 7 to 9 feet high and gets quite broad with age. ‘Shin deshojo’ changes color with the season like a chameleon does with its background. 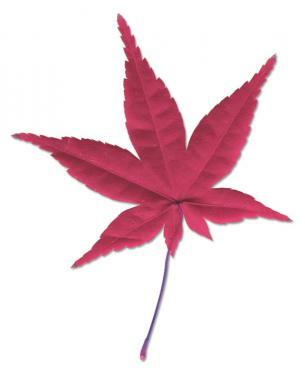 The small, palmate leaves emerge a bright pink-red in spring. 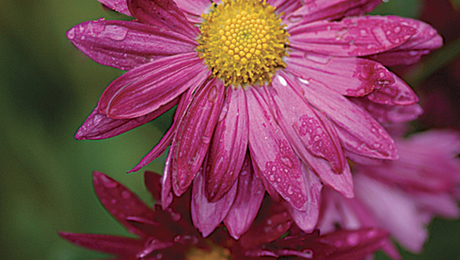 As the foliage turns green in summer, it retains traces of deep pink. Autumn finds the leaves turning back to red. 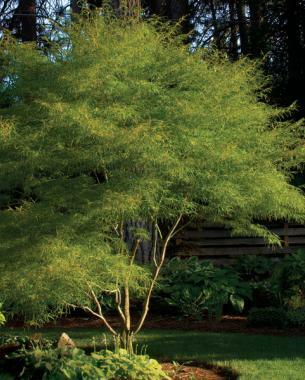 This cultivar’s form naturally becomes a 10- to 12-foot-tall haystack, or the tree can be opened up to reveal its architecture through pruning. 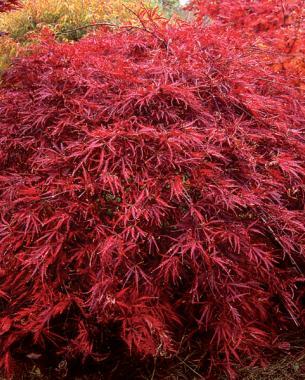 ‘Seiryu’ is a standout among the eye-catching laceleaf Japanese maples. It retains the delicate foliage common to this group, but instead of the characteristic mounding habit, ‘Seiryu’ stands upright with a spreading canopy, reaching heights of 10 to 14 feet. The intricate form of the leaves provides interesting texture in spring and summer. 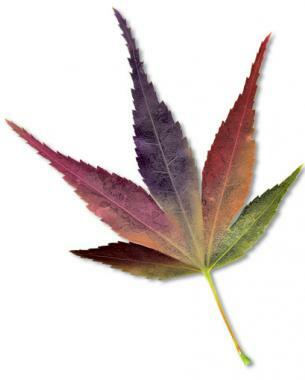 But in fall, this cultivar, whose name means “blue-green dragon,” explodes into color as individual leaves develop a mix of red, green, orange, and yellow. 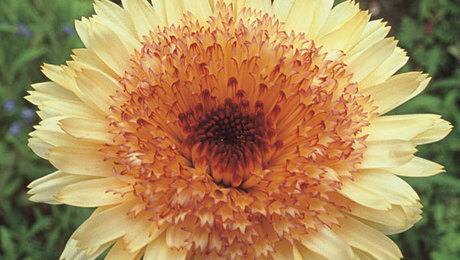 ‘Seiryu’ grows happily in full sun or bright shade. 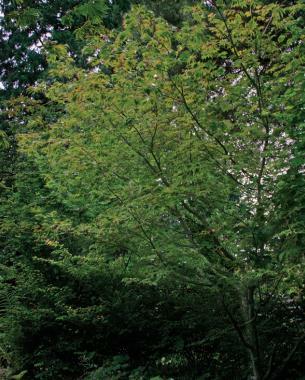 If you want a tree that retains the upright habit and fall color of this tree but offers a heavier texture, try ‘Osakazuki’ (see the first photo in this article), whose leaves are fuller than those of ‘Seiryu’. ‘Koto no ito’ may resemble a cheerleader’s pom-pom when it’s young. Age and good pruning, however, reveal a more dignified specimen up to 9 feet tall, featuring a strong interior architecture that contrasts with its fine leaves and outer branches. 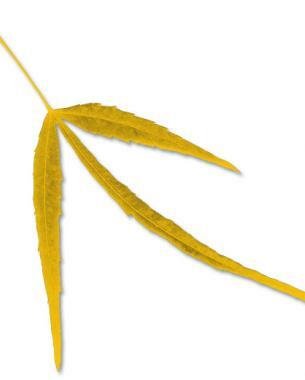 The deeply divided foliage is long and thin like fringe. It emerges with crimson tinges before turning to solid green in summer. In fall, it turns yellow, burnt orange, and red. The leaves on each year’s new growth are much larger than the rest. ‘Koto no ito’ is a durable tree that adds a unique texture to any setting. ‘Sango kaku’ is always exciting to look at, courtesy of its bright red branches. 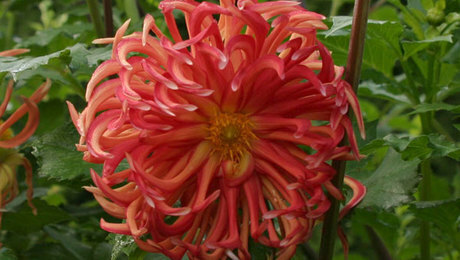 This cultivar, whose name means “coral tower,” features green leaves that turn from yellow to pumpkin orange in fall. Reaching a mature height of 18 to 22 feet, ‘Sango kaku’ has a growth habit that can get a bit messy, so it should be pruned annually from a young age. 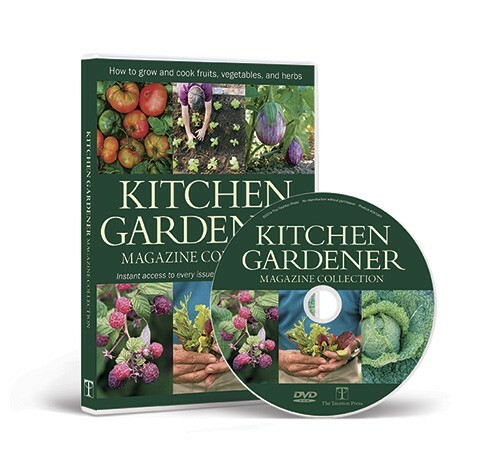 Plant it where it will have excellent drainage; it is particularly vulnerable to fungi causing black stem disease and can quickly die from it. ‘Vitifolium’ is another A. japonicum cultivar that is quite vigorous and gets up to 30 feet tall. 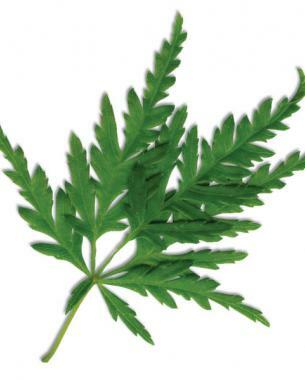 With its 5-inch-long and 6-inch-wide green leaves, it makes a majestic impression. Related species: Though Acer palmatum is the most common, several other species, such as A. japonicum, A. sieboldianum, and A. shirasawanum, are considered Japanese maples. 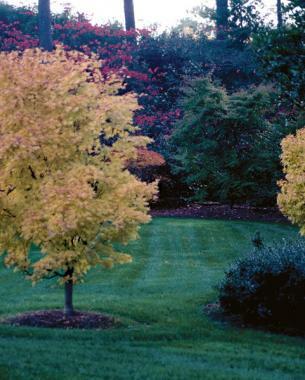 Hardiness: While most Japanese maples are hardy in USDA Hardiness Zones 5 to 8, some are recommended only to Zone 6; Acer sieboldianum can take Zone 4. 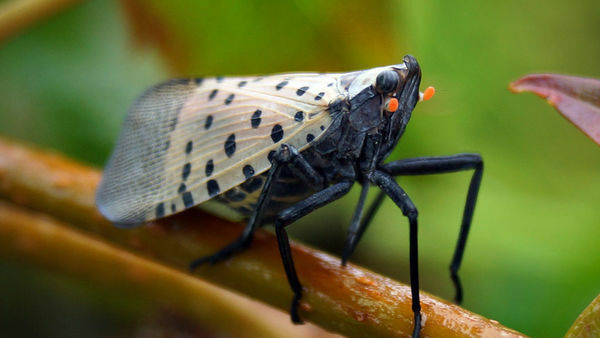 Protect all Japanese maples from the afternoon sun if located in Zone 8 and from bitter winds in Zone 4 and the northern sections of Zone 5. Conditions: Grow these trees in full sun to partial shade. 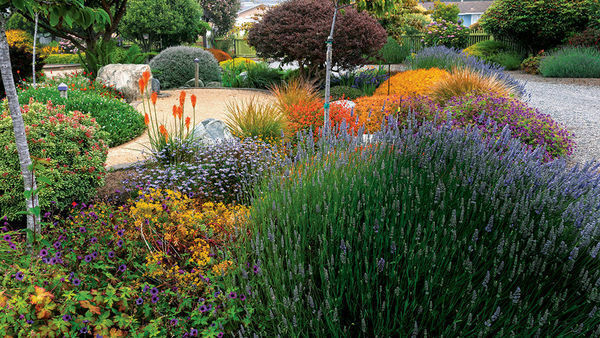 They are tolerant when it comes to soil unless planted in a site with poor drainage or a high pH. 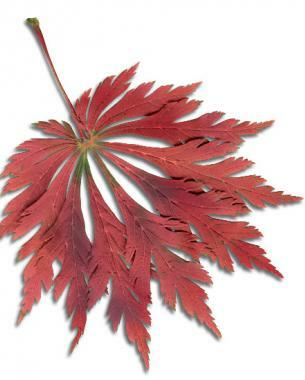 Planting: When possible, plant Japanese maples while dormant. If your tree has already begun to leaf out, wait until the danger of frost has passed before planting. 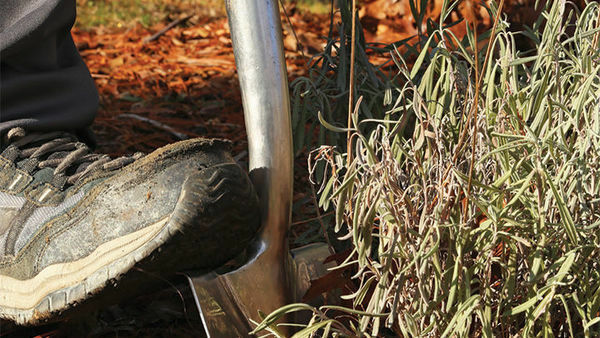 In clay soil, ensure proper drainage by planting on a slope, or with the root flare about 3 inches above the soil line then mounding the earth around it. 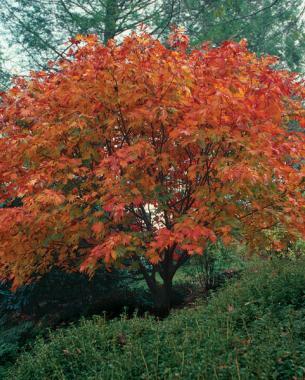 Maintenance: Under normal conditions, established Japanese maples do not need additional watering or feeding. If you decide to add fertilizer, avoid synthetic options because maples abhor the salt they contain. 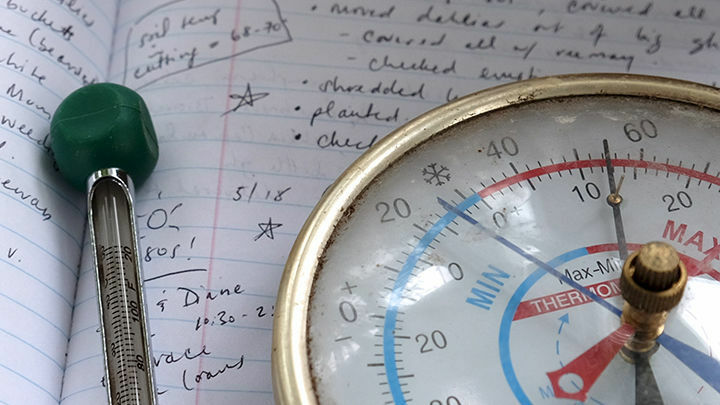 Prune once every few years to improve air circulation and to enhance the form. 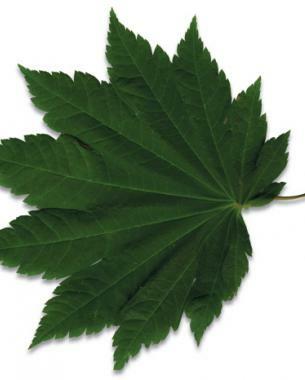 Pests and diseases: Japanese maples are not prone to harm from pests or diseases. 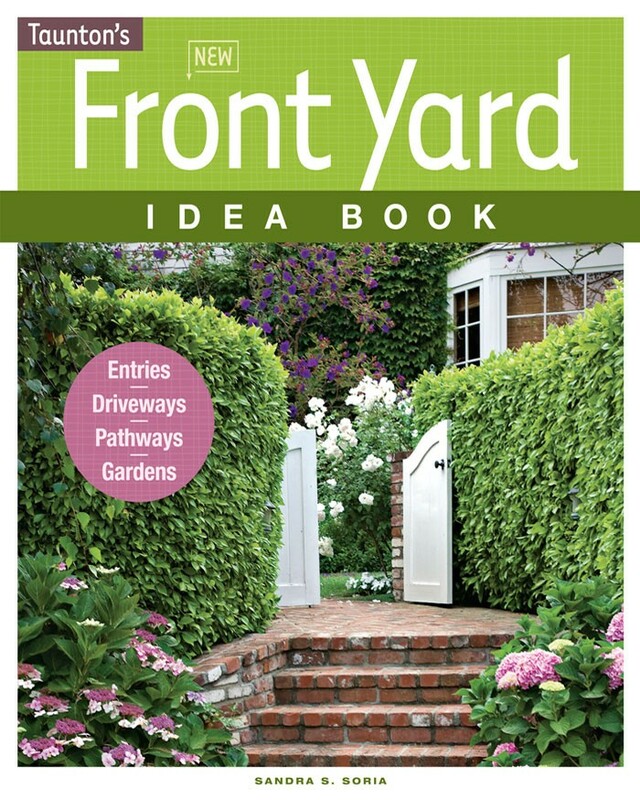 I have a weeping green Japanese maple in a 13 by 13 courtyard and would like to add some plants to the area but am unsure as to what would add to the look of the area. Any ideas. The area is half day full sun. 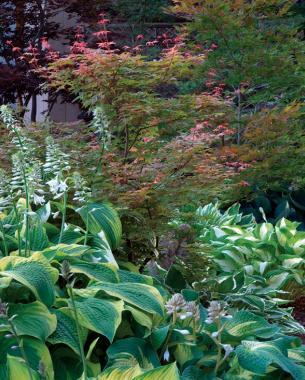 Panicle hydrangeas pair well with Japanese maples, as well as dark leaved Canna lilies. 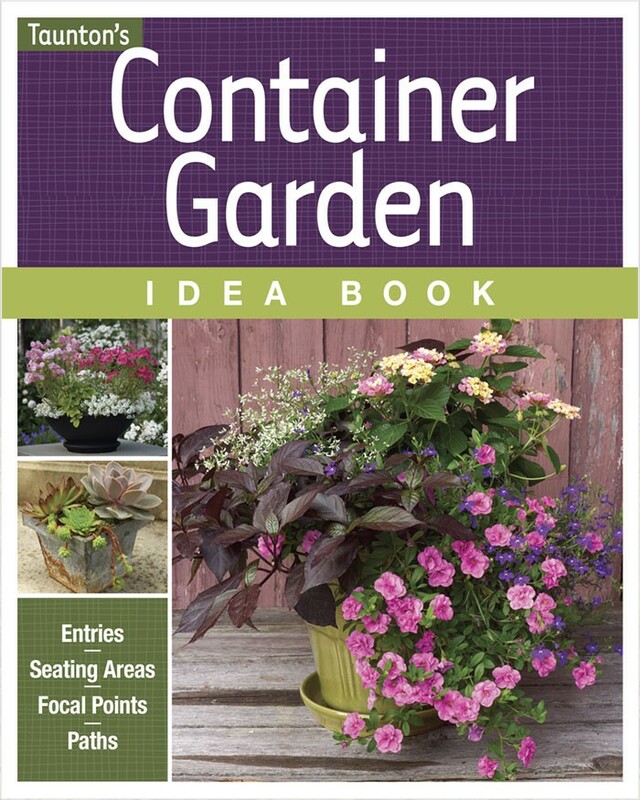 Also any perennials with an upright growth habit would contrast nicely with the weeping maple, and add a spot of color (echinacea, rudbeckia, or heliopsis). 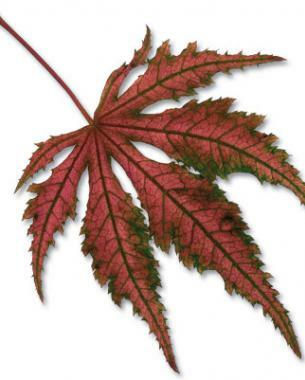 Is it too late to plant a tree--any form of Japanese maple---Oct.3 ? This is a much better time than spring. The roots have a chance to get established and it's not too hot. 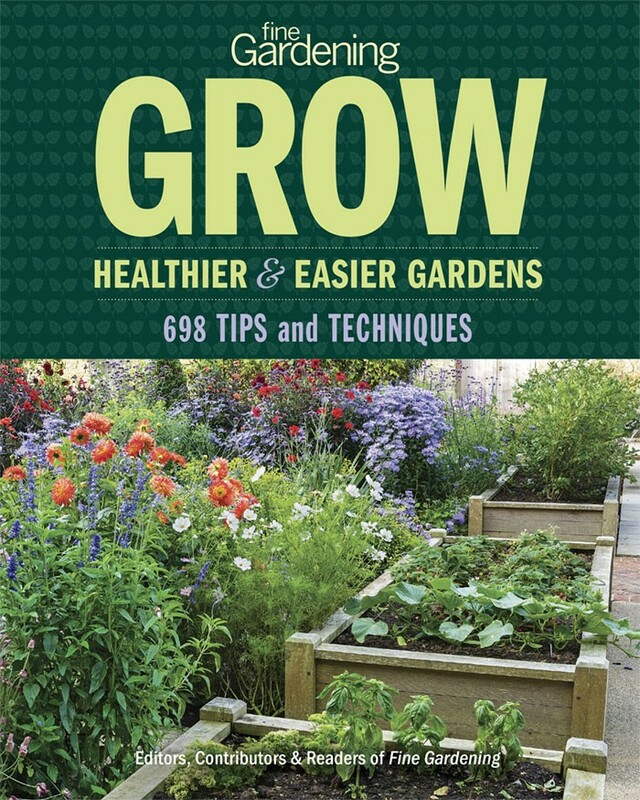 Thank you, Joan Fisher,-Happy gardening!